Our verified director of chemical engineering email database helps you to contact those who have influence over purchasing decisions at high-tech research labs and pioneering scientific firms across the country. This B2B contact list is a key ingredient in the formula for business success! When you need to make direct contact with C-level executives in the chemical industry, then you need this verified VP of chemical engineering mailing list from Bookyourdata.com. Each premium business email list we offer has the real names, company information, phone numbers, fax numbers, postal addresses, and email addresses you need to network with sales leads and close deals with chiefs of chemical development projects. We've left no stone unturned in creating this lead chemical engineer email database because we want you to have the most comprehensive data available. 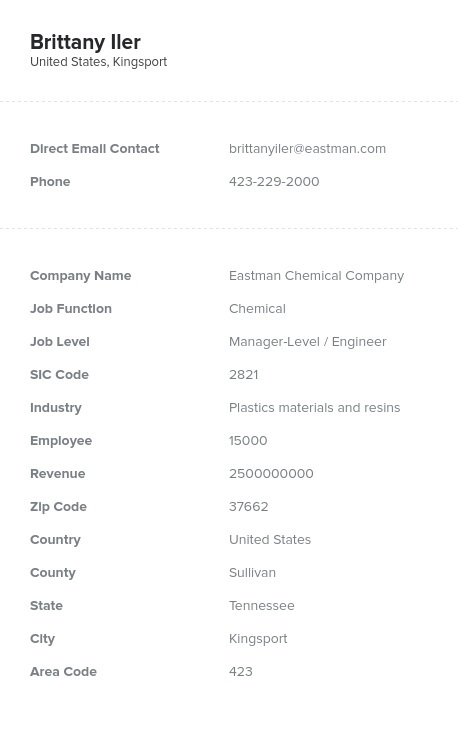 Each chemical technician manager mailing list we offer is double-checked for accuracy, by both humans and machines. Your time is valuable, and we want to make sure that when you buy email leads from us, you are getting a chemical engineering manager email list that makes the best use of your marketing time and budget. Get the contact information for chemical industry professionals fast when you purchase this highly qualified senior chemist email database, which is ready for download as a .CSV file that's easy to incorporate into your sales software. The key element for a successful B2B marketing campaign is right here: Buy this director of chemical engineering mailing list today!